Teaching and travelling: Italy in three Months, six Cities and six Families – A.c.l.e. What am I going to do with myself over the summer break?” I knew that I wanted an opportunity to practice my language skills while earning some money, but was not sure what was out there. 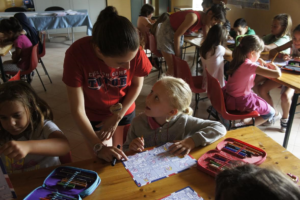 My friend had mentioned that she had worked in France the previous summer at an activity centre with children, I thought a similar thing in Italy would be perfect for me: I love Italy, working with children, and travelling! Low and behold, a quick search on the internet, a click of a button and I stumbled across ACLE: a non-profit organization who pride themselves on teaching English through theatre, song and activities. Their mantra, “emotions generate learning”, is at the heart of their organization. They organise summer camps in Italy, where English-speaking tutors teach a class of Italian students anywhere from 4-16 years old, and, as a team, are responsible for running the camp. They cover all accommodation, food and travel costs while you are working and send you to a different part of Italy every fortnight! They also give you a study grant to cover your costs while there. They expect enthusiastic, confident and organized tutors who are creative, excellent communicators, flexible and punctual. After an application form, a few paragraphs about my interest in the organization, some videos … , I was off to Bella Italia! And so my trip began! My first week of intense training spent in the leafy mountain village of Castellaro, where I met tutors from all over the Anglophone world. 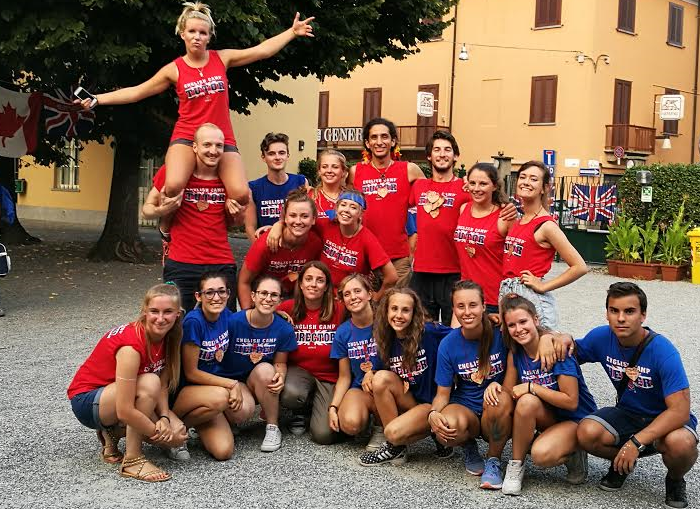 We spent a week training altogether in the blistering Italian summer heat with a jam-packed schedule; it was an intense concoction of getting to grips with all the teaching material for different students, perfecting he camp songs, getting our creative juices flowing and teamwork. By the end of the week we were exhausted, but running on adrenaline ready for our first camp! Tutors arrived at camps at around 8:30 with students arriving at 9am. First thing was a “warm up circle”, a series of songs and games to get the students’ energy levels up! We would then split off into individual classes; one tutor to 12-20 students with a bilingual Italian teenager to translate and difficulties. The afternoons would then be joint creative activities pre-prepared by the tutors. Camp would formally finish at 5pm and after an evening meeting with the camp directors, I was off home to spend the evening with my host family. During the stay we were placed with host families with children at the camp. I cannot speak highly enough of the families who treated me like their own daughter. Most of whom I am still in contact with and have invited me back this year. Some of them even went out of their way to ensure I experienced every part of their local culture. From taking me on day trips to Florence, trying Florentine cuisine like panzanella and cantuccini e vino santo or taking me to breathe-taking grotte in Treviso and giving me historical tours of neighbouring towns. My final family who lived in Turin were determined that I had the full “Piedmontesian experience”. Not only did they take me for a day trip to see: the Mole Antonelliana and the museo Egizio (the second largest Egyptian museum in the world! ), but they took me to a traditional Piedmontese restaurant and taught me some Piedmontese dialect and even drove me across the Italian-Swizz border to Switzerland for the day! I was fortunate enough to have toured Northern Italy in my three months there. 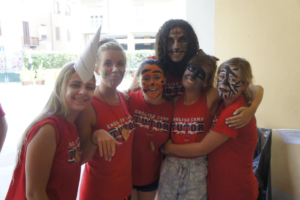 I started off with a two week camp in Florence, then Treviso, Bologna, La Spezia and Turin. And these were only the places I taught in! The ACLE Team advised us to take some weeks off from teaching to go and explore Italy/relax! I also managed to see San Remo and hopped over to France to visit Nice, Monte Carlo and Menton. By the end of my time there I can honestly say that I had visited more of Italy than the UK!